Taking time to care for your car can be time consuming, but it’s vital to keeping costs low, staying safe, and getting the most out of your car. Tire care is one of the basic car care categories. Tires are what connects the car to the road, giving the driver control over speed, stopping, and steering. Every car and tire has a recommended tire pressure range. 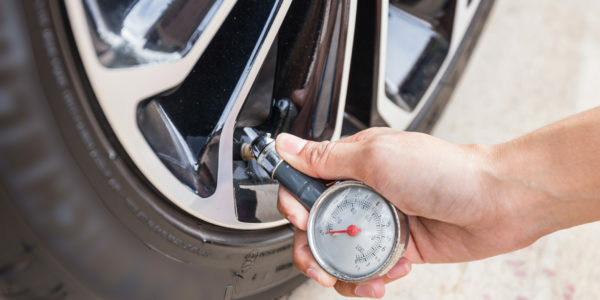 It’s simple to check and inflate your tires – you might even get a free tire pressure gauge instead of a pen from your local tire or auto care shop. Fuel stations often have free air or air for 50 cents – $1. Rotating your tires, or switching the front and back and the right and left sides regularly helps maintain even wear on the treads of your tires. There are other things that can lead to uneven wear, like worn suspension parts, unbalanced wheels, and improper alignment. Usually, you can tell that something is off if your steering wheel is vibrating excessively while you’re driving. You can check your tire treads manually too! To make sure there is enough tread left to safely drive on your tires, take a penny, put it between the treads with Lincoln upside down, and make sure the treads at least reach the top of his head. If you’ve hit something, whether it’s an animal, a toy or bicycle, a large pothole, or other debris in the road, take a look at your tires. Check for bulges, cuts, punctures, or any other visual damage. Do you know what condition your spare tire is in? It also needs to be properly inflated and have adequate tread just in case something happens to another tire while you’re on the road. Driving to protect your tires is the same as driving safely. ● Don’t drive under the influence or while distracted. Although general wear and tear will happen, an accident is the most damaging thing to any part of your vehicle.